Salvation And Survival: WARNING! Beware of "Mindfulness" and "Mindful Intervention"! WARNING! Beware of "Mindfulness" and "Mindful Intervention"! As usual, in the busyness and chaos of my life, I manage to hear snippets of the world's conversations all around me, and sometimes the Holy Spirit will "zing" me with a "Pay attention to this" summons. Such was the case when I overhead a Fox News announcer commenting that the Department of Education is spending upwards of $2.5 million to bring a "mindfulness intervention" to kindergarteners in Chicago, where kids can go to “calm spots” in the corner to watch nature videos. What the 10-second sound bite did not tell the audience was that this government program is in conjunction with the National Institutes of Health, which has spent over $100 million studying this New Age meditation technique called "mindfulness". What's more, The Education Department has introduced this “Calm Classroom” program into 3,000 schools through its Investing in Innovation Fund. What?!?! Exactly what are all these "government programs" that taxpayer dollars are funding, and what exactly is it that they are trying to accomplish?? To begin with, Investing in Innovation Fund is "to promote student achievement and preparation for global competitiveness by fostering educational excellence and ensuring equal access." And if you follow the rabbit trail, they propose that advancing student achievement can be accomplished through this theory based on "mindfulness intervention". But what, precisely, is that? According to the grant abstract, written to acquire funding, "Mindfulness is a secular, psychological mode involving non-judgmental focus on present-moment sensations, and has been shown to have a number of benefits to well-being. Our project offers an innovative approach not only because mindfulness is unique relative to traditional social-emotional learning (SEL) programs, but also because of added elements designed to replenish children’s focus directly back into the content of school, including always-available ways to take very brief ‘brain breaks.' " (Please pay attention to the words and phrases that I have underlined; you will see their significance shortly). So, if kindergartners in Chicago are the focus group for this grant, just what is the government hoping to accomplish or prove? 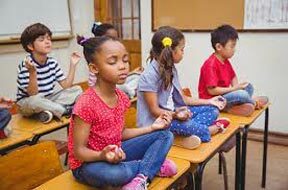 According to the written grant, the Chicago Public School System, along with various Institutes and a trademarked program called Calm Classroom, hope to employ a mindfulness-based intervention to increase the self-regulation and engagement in learning of young children in low-performing schools. Furthermore, the grant states, "The need for this approach arises from two conditions. First, mastery of self-regulation skills during the early years of schooling has been shown to be as, if not more important to long-term academic competence than intelligence or domain-specific knowledge. Second, increasingly younger children are experiencing high levels of trauma, unpredictability, and toxic stress, thus arriving at school with tendencies to either act out or disengage, rather than being ready to participate productively in the classroom community and learn." That whole line about "increase self-regulation" says to me that they don't want any original thinkers, or kids who think outside the box, or who might challenge the teacher and other students with their uncontrolled imaginations. What happened to the psychological motto of "not killing the child's spirit", that was so popular in the 60's? Besides sounding like a bunch of New Age hocus-pocus, it seems very clear to me that the public school systems have lost control of their students, and now need to engage in some kind of "brain games" to mollify and reduce classroom disruption. I don't know about you, but a trip to the principal's office in my grade school days, was enough to keep me from acting up. I knew that at the end of that hall might be the Athletic Coach with a paddle. But it's not enough to point out the lack of discipline in schools, or to lament the decidedly "secular", environmental, and mystical approach to maintaining classroom control. You really need to know what is really behind this "mindfulness" movement. Here it is: The skill of mindfulness can be gradually developed using meditational practices that are described in detail in the Buddhist tradition. The Five-Aggregate Model, an ancient model of the mind and body, is a helpful theoretical resource that could guide mindfulness interventions. The term "mindfulness" is derived from the Pali-term sati, which is an essential element of Buddhist practice, including vipassana, satipaṭṭhāna and anapanasati. It has been popularized in the West by Jon Kabat-Zinn with his mindfulness-based stress reduction (MBSR) program. Now, here is where it gets frightening for me.... Did you know that in 2012, Congressman Tim Ryan of Ohio published A Mindful Nation, and has received a $1 million federal grant to teach mindfulness in schools in his home district? Or, in 2000, The Inner Kids Program, a mindfulness-based program developed for children, was introduced into public and private school curricula in the greater Los Angeles area? Or how about the fact that The Holistic Life Foundation, a non-profit organization that created an in-school mindfulness program called Mindful Moment, is currently serving almost 350 students daily at Robert W. Coleman Elementary School and approximately 1300 students at Patterson Park High School in Baltimore, Maryland? At Patterson High School, the Mindful Moment program engages the school's faculty along with the students during a 15-minute mindfulness practice at the beginning and end of each school day. They are allowed to practice an element of Buddhist meditation, but a prayer to the One True God of the Universe is illegal? And just to top off the widespread use of the Mindfulness Movement, consider this: One study involved enrolling college students in a course about mindfulness that included guided mindfulness meditation as part of the curriculum. After the semester, pre- and post-levels for different aspects of mental health were compared and students were found to have more non-judgmental stances towards their thoughts and feelings. This is believed to result in better stress-coping skills, improved academic performance and quality of life. Furthermore, scores continued to improve for the weeks following the end of the course, demonstrating the long-lasting effects of mindfulness meditation. Do you see what I'm trying to show you? For years now, our public schools and universities have been preparing our kids to become robots! Let's not teach them critical thinking skills! No! Let's teach them all to hum a mantra and dull their minds so they are easily contained and mastered. And it is now instituted from kindergarten to college! If you really want to see the full scope of what I believe is a harmful movement to capture and control the minds of our kids, read the Wikipedia entry. I know not everyone thinks Wikipedia falls under the banner of incontrovertible truth, but if even a fraction of what they report is true, it should frighten all parents. Don't be fooled by the claims that "calm spots" and "brain breaks" are needed elements to help your kids learn better. Just teach them Readin', Writin', and Arithmetic, and how to think for themselves! Go to the article at The Free Beacon website for more information on what the Department of Education has in store for your kids. 2 Corinthians 11:3 "But I am afraid that as the serpent deceived Eve by his cunning, your thoughts will be led astray from a sincere and pure devotion to Christ." All that I can say is...come quickly, Lord Jesus! Maranatha! We need You! Oh Belle, our grandchildren are going to be submersed in all of this stuff! I doubt that my daughter-in-law or son would see the danger here. They go to church every Sunday, but their personal relationship is not so fruitful. They are very nice and very loving and are great parents, but the world is creeping in on them and they don't see the enemy for who he is. She has and goes to parties that sells fragrances. While I don't think that there is necessarily anything obviously un-Christian about that, I just see her falling deeper and deeper into the New Age traps. When I try to point things out, they think that I am "over the top". Between this information that you have shared today and how schools are still continuing to push God out, and teaching children that they have sexual choices to make in regard to their bodies - we are doomed unless God comes soon. I try to speak Truth to them as often as I can, but I can also see the ways of the secular school creeping into their lives. Lord, we pray that you will miraculously protect our young children and grandchildren from the enemies schemes. I am right there with you! I fear the enemy's indoctrination of our children and I pray for God to breathe His Truth into their lives. Keep speaking God into their lives, and ask the Holy Spirit to open their hearts, minds and ears. Believe in His power to reach them and to block the unholy messages they are receiving. Never give up hope! Hi Belle ... I'd like to suggest that you consider for a moment that these programs aren't a threat to Christianity. Try the idea that meditation may not only help people be more calm and self-aware, but more productive in every way, including within their faith. Try the idea that during a mindfulness break, a child who has been raised as a thoughtful peaceful Christian has the chance to step out of a scary, chaotic, stressful day and be alone with her God for a few minutes. The techniques are no more or less robotic than reciting the Lord's Prayer or singing Amazing Grace, which you can't do if you can't breathe. Mike, I agree that meditation can benefit Christians, but it depends on what you are meditating on. Re-read the section of my blog where I focus on the specific "Mindfulness" concept being promoted in schools: "According to the grant abstract, written to acquire funding, Mindfulness is a SECULAR, PSYCHOLOGICAL MODE involving non-judgmental focus on present-moment SENSATIONS, and has been shown to have a number of benefits to well-being. Our project offers an innovative approach not only because mindfulness is unique relative to traditional social-emotional learning (SEL) programs, but also because of added elements designed to replenish children’s focus directly back into the content of school, including always-available ways to take very brief ‘brain breaks.' " See, it is the Secular, psychological aspect of this program that bothers me, and the focusing on sensations ... there is nothing mentioned about God or Christianity -- and of course not! It is in schools where God is outlawed! And, as a Christian, I would be uncomfortable with anyone teaching my child that there are various "gods" or "feelings" to meditate upon. The Word says in Isaiah 26:3, "You keep him in perfect peace whose mind is stayed on You, because he trusts in You." That is what we should be teaching our children... YHWH is their peace. I just do not trust the school system to teach the Truth. That is a parent's job. I have no problem with meditating -- if it is upon Jesus. I am simply warning against opening your mind; emptying your mind... for where there is a vacuum, something will fill it. The Bible tells us to "fill" our mind with thoughts of God and the Word. I am still skeptical of teaching our kids to focus on "sensations" and "freeing the spirit" to pursue things. You have to be careful to not open yourself to other "spirits" ... and I simply don't think kids have the maturity to defend against the "unclean" ones. 1.Sit comfortably, with your spine erect, either in chair or cross-legged on a cushion. 2.Close your eyes, take a few deep breaths, and feel the points of contact between your body and the chair or floor. Notice the sensations associated with sitting—feelings of pressure, warmth, tingling, vibration, etc. 3.Gradually become aware of the process of breathing. Pay attention to wherever you feel the breath most clearly—either at the nostrils, or in the rising and falling your abdomen. 5.Every time your mind wanders in thought, gently return it to the sensation of breathing. 6.As you focus on the breath, you will notice that other perceptions and sensations continue to appear: sounds, feelings in the body, emotions, etc. Simply notice these phenomena as they emerge in the field of awareness, and then return to the sensation of breathing. 7.The moment you observe that you have been lost in thought, notice the present thought itself as an object of consciousness. Then return your attention to the breath—or to whatever sounds or sensations arise in the next moment. 8.Continue in this way until you can merely witness all objects of consciousness—sights, sounds, sensations, emotions, and even thoughts themselves—as they arise and pass away. No, Mike, you did not offend at all! I just think we are on different planes about this question. As I said, I have no problem with meditating when we are filling our minds with God. I simply find it concerning when we are teaching this method of meditation to young children, when they are not mature enough to keep their minds from being taken over by spiritual entities. You are simply supporting the calming results of meditation... I see more danger there than you do, and I don't think we are going to agree, so I thought it best to end the conversation. Thanks for your viewpoint. I note that David didn't meditate on his own breathing, but on the word of God...good enough for him, good enough for me. Plus 'mindfulness' comes out of a tradition that does not acknowledge the person/mind as part of the real world, but a transient almost illusory stage; whereas the Bible tells us that 'mind' is real, and most real in relationship with its Creator our Lord. Well said, Anonymous! I guess I like the implications of Isaiah 26:3 ... "You keep him in perfect peace whose mind is stayed on You, because he trusts in You". A mind focused on God will give you all the peace you need.